March 9, 2016 — Comments are off for this post. On Thursday, March 3rd, Brand Joint Founder, Jennifer Culpepper, was the keynote speaker for the Women Grow DC Signature Networking event. 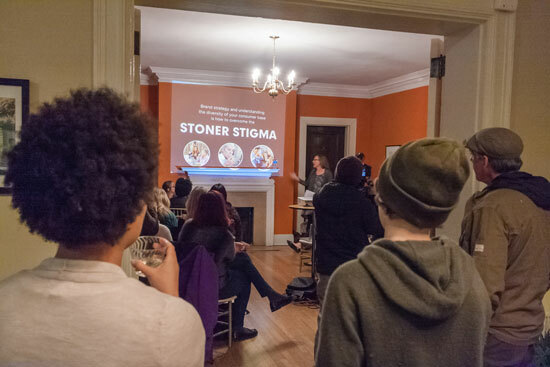 Jenn talked about overcoming the stoner stigma in the cannabis industry through brand strategy — specifically understanding the target audience and learning customer empathy. We were honored to meet with and speak with over 40 DC-area cannabis enthusiasts and entrepreneurs. Women Grow Signature Signature Networking Events are held on the first Thursday of every month in various cities across the United States. The events connects women (and men) at various stages of their cannabis careers, whether they're established cannabusiness owners or just getting to know what the industry is all about. After Jenn’s presentation, we mingled with several passionate entrepreneurs that want to make a difference in the cannabis industry with their products and services. With a slideshow and workbooks for every attendee, Jenn explained that branding is so much more than a logo and pretty packaging. As Amazon Founder, Jeff Bezos said, "Your brand is what people say about you when you're not in the room." Jenn stressed the importance for brands to thoroughly understand their target audience in able to provide them with an experience they'll love. To do that, you must empathize with your customer and really dig deep into their day-to-day life. The presentation went incredibly well and we were thrilled to get so much feedback and participation from the audience! Thanks to Women Grow for hosting such an awesome event. We can't wait to attend many more!